Gov. 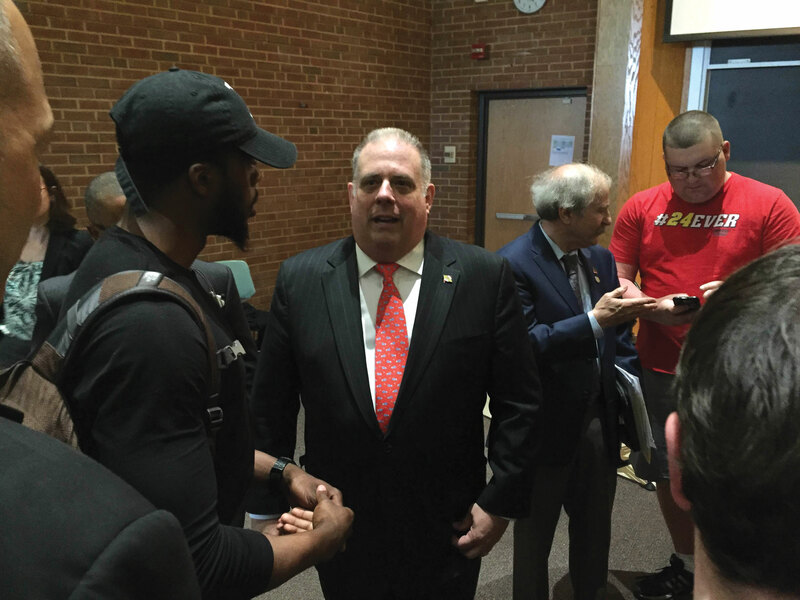 Larry Hogan visited Towson’s campus last week to speak with professor Richard Vatz’s persuasion class and other invited guests. Hogan touched on his experience as a relatively-new governor—highlighted by the fact that he was speaking on the one-year anniversary of Freddie Gray’s death. The “riots,” as Hogan called them, broke out in Baltimore just 90 days after Hogan took office. Since he was speaking to Vatz’s persuasion class, Hogan did his best to “stay on topic.” Part of his remarks focused on how he gained an audience and rose to the office of governor. After starting the political group Change Maryland, Hogan said that he realized he needed to grow his audience. Following cues from President Barack Obama’s 2008 campaign, Hogan said, he and his team took to social media. “Our little group grew to tens of thousands of people,” Hogan said. After he spoke, the governor took questions from the audience. Students asked Hogan what his greatest accomplishment so far was, what it was like working with a Democratic legislative body and about the nature of running a campaign for public office. Hogan said that there was a lot that could be accomplished in the executive branch alone—like cutting the cost of tolls for crossing the Bay Bridge, he said—and that some “really good things” did happen in the legislature this year. One of Hogan’s greatest disappointments was not getting a bill through that would create nonpartisan re-districting of Maryland’s congressional districts. “We have the most gerrymandered districts in the entire country, and it’s not something to be proud of,” he said.